Husb and I spent most of today down the allotment, digging, harvesting, weeding, laying slabs, pruning, watering. It was boiling hot and we’re shattered. A hot bath with Epsom Salts helped to ease the aches. I wasn’t in the mood to do any drawing but I’ve set myself the goal of drawing every day so I got stuck into my Samsung Galaxy Tablet Note 8 using the free Markers app. 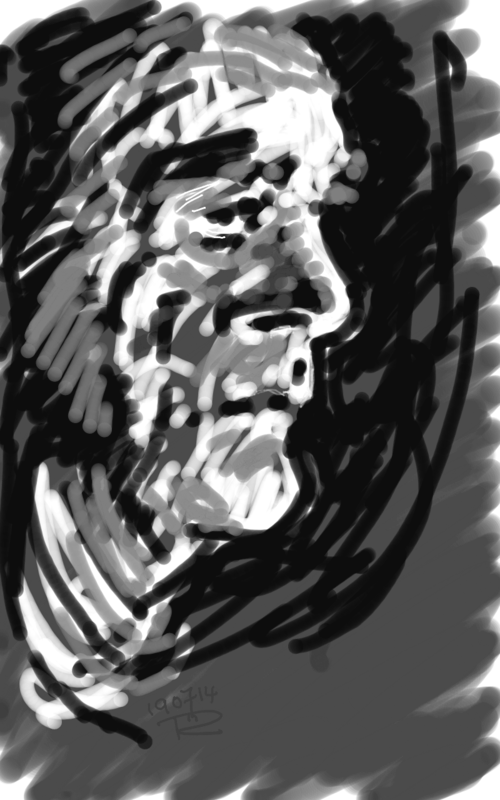 Husb was looking at his Tablet and it was highlighting his face in the dark living room. I put in a dark grey background and worked quickly in black, white and greys. It’s different to the way I normally work and that’s because I was too tired to bother. But I like this. A happy accident.